Rumung, a name that doesn’t appear on any Chinese maps. The islanders don’t like outsiders, so Rumung is also nicknamed the Forbidden Island – because outsiders are forbidden to set foot there. They hid themselves for fear of being discovered. Several hundred years ago, the Yap islanders were already proficient enough in the art of illusion, that they were able to conceal the entire island from the Spanish as they explored the Pacific. Compared with Palau, which from the 19th Century onward was to become the headquarters of the German and Japanese Empires for the Pacific region, Yap, “discovered” by the Portuguese as early as the 16th Century, seems, like a pebble, to have skimmed along the surface of world history, watching impassively as the fleets of ships passed by, quietly praying that the outsiders never discovered their island, that they never docked there. Wading through the mud of taro fields there, I often wondered how my classmates carried out their field research? “Observation” seems to be a synonym of “”skiving off”. Apparently French structural anthropologists in the 1970s always carried out field research in small work teams: the botanists would focus on collecting samples, psychologists would employ their erudite techniques to divine the psychology of the native peoples, and the economic anthropologists went about measuring the surface area of the fields and the daily food consumption of the residents and so on. They would stay for no more than three months. After collecting enough samples, they would up sticks and leave. Of course there was also Bronislaw Malinowski (1884-1942), who anglophone anthropologists look up to as creating a bench mark for field work; if his return journey hadn’t been delayed by the First World War, a paradigmatic approach involving long term individual field work might not have been created, the indigenous people, I fear, would not have been endlessly pestered by the solitary Pole in his gold-rimmed spectacles and the tribal mountain villages of Taiwan would not be brimming with graduate students, naïve or seasoned, dull-witted or passionate, thinking back to the great anthropologists that preceded them over the last hundred years, while struggling to survive in the field. Eight years ago, I was weeding the fields of a little island that locals call the ‘Island of Men’ and that the Han call ‘Orchid Island’. It was for a period of just under six weeks. Every day I would put on sun cream and follow an old couple into the fields, listening to an Mp3 of ‘Country Road’ whilst I weeded. After listening to the melody around forty times on loop I could make my way back home. Or perhaps it was even longer than that? Memory tends to fail me. Due to my father’s swarthy skin, I was never able to read his emotions on his face, but I knew at that instant that his expression had darkened just then. “Actually, I really quite like taro.” my father would say. My friend gave a chuckle, probably wondering where Cambridge was. Although he was only three years older than me, my friend still perhaps found it hard to understand the mindset of islanders from mainland Taiwan, just as I, even though I followed in their footsteps everyday as they came back and forth from the fields, found it hard to understand why the old people went to inspect and weed the taro fields and to make sure they were well irrigated, day in, day out – or rather, I only understood it rationally, just as I “knew” that their kinship system was bilineal with patrilineal tendencies. 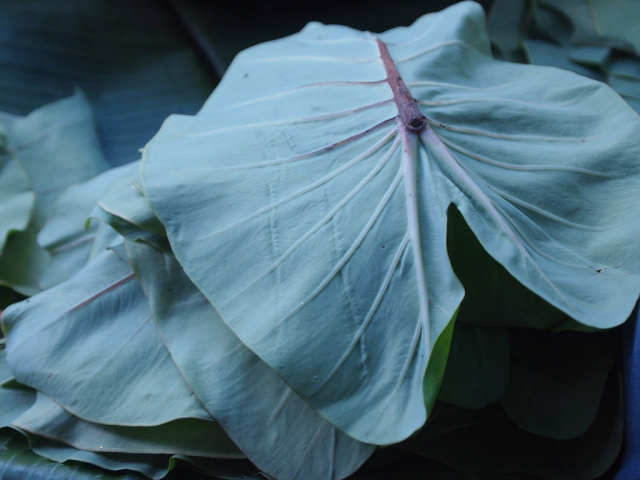 As the old people looked anxiously at the stalks and leaves of the taro plants and the rotten bodies of the taros themselves, inside I was just desperate to clarify the principle on which the social hierarchy was based. “The taros have gone bad,” one old man said. ‘It was your own choice, no? You could have studied English Literature too.’ he said. Four years ago was my first trip to the Western Pacific to the ancient island of Yap, which means “close to the earth”. That’s what the mother of the family I was staying with told me. There was insecurity hanging in the air of spring 2012. At the end of 2011, a group of developers from Sichuan had their sights locked on the island of Yap, and they were touring the island in droves promoting a large tourist development project that would change the face of the island. After agreement from the state legislature and the Council of Pilung (Council of traditional chiefs), ninety per cent of islanders were still against the project, but without any way of knowing how to find out the details of the development project, the majority of their voices gradually sank into silence, despite the fact that it would be the silent majority that would lose their homes, who would leave the taro fields, the forests and their fishing grounds, and would have to move to apartment buildings knocked together for the purpose. Unable to plough the fields, what would the islanders depend upon for their livelihood? Subsidies. Subsidies that would quickly burn a hole in the residents’ pockets. Sitting on the mat in the baking heat of the concrete building, the phone is scorching to the touch. It’s an evening in March, it’s very cold in Taipei. The dusty island without summer or winter is always blisteringly hot. I was talking to an elder from the church on the phone. We talked about the Chinese entrepreneurs who were fixed on the development plan no matter what the setbacks might be. We talked about it for a long while. The receiver was getting hot. There was sweat dripping from the lobe of my ears, forcing me to switch ears every now and then. “Our culture no longer fits the context of reality. It’s extremely lacking in modernity. It’s destined to be eliminated by the shifting times.” I listened. I thought back to the prediction my language teacher had made to me. The elder’s tone of voice was calm, warm and deep. It was just like that of the dusty islanders, never revealing his underlying emotions. “No. The war is just starting. The investments are too great. There are just too many factors involved. No matter what part of island life you talk about, the consequences of large scale tourism would be dire, not something that this island could cope with. Moreover, if more and more people are thinking the same thing, the situation will take a turn for the better, the majority of people can push in the direction that they want to see Yap develop towards.” The youthful exuberance and urgency was ever present in my voice back then, like the surface of a turbulent sea. China wouldn’t give up. I realized deep down. Even if the majority of the islanders had doubts, or were against it, even if they got together to protest. To this day the islanders from the dusty island can still hear the sounds of roosters crowing and dogs barking, and catch glimpses of the smoke from cooking fires. The island is temporarily hiding itself because it doesn’t want people to discover it. The islanders of the Forbidden Island don’t like visits from outsiders; although they once graciously consented to let an American anthropologist, David Schneider, to set up camp there for one year. One year later, Schneider brought a pile of papers back home with him. The kinship system that he recorded on that pile of papers still remains somewhat of an enigma, as it doesn’t easily fit into any of the known patrilineal or matrilineal kinship systems. Researchers have opined that as Schneider was determined to get close to the lowest stratum of local people, his arrival coincided with the withdrawal of the handover of colonial power – the Japanese had just left, and the American navy were on the point of arrival, Schneider, as a Jew from New York, however strictly he adhered to the anthropological notion of political neutrality and how he tried his best to distance himself from the neo-colonial regime – specifically choosing kinship as his research topic, which at the time was a field of social science that didn’t involve politics. However, unavoidably, Schneider’s identity, just like the colour of his skin, decided the way he viewed things. This standpoint would tinge everything he saw, even it wasn’t a standpoint he chose for himself. What was more crucial was that in many Austronesian societies, “kinship” is “politics,” just as religion is politics. From Formosa, the “beautiful” island, we moved east to the Island of Men, Orchid Island, then we moved still further east to Micronesia and the Island of Dust, Yap. The ignorance and the invasive nature of the Han, from 1970 to 2012, is like layer upon layer of refracting lenses. The only difference was that Orchid Island was faced with the Taiwanese, who at that time had no idea of what respect for other ethnic groups was. In the case of Yap, however, what they are faced with is a reconfiguration of power in the Western Pacific under the guise of a large tourism development project. Perhaps, the residents of the Sunken Island were discussing the future of their island right now at the bottom of the sea. This time, the islanders of the Forbidden Island, and those on Yap Island with its name which means “close to the earth,” would no longer be able to duck and dive out of the eyesight of the group of tourism developers. In 1946 and 1947, the American anthropologist David Schneider carried out his fieldwork in Rumung, in the north of Yap. One year later, Schneider brought a great pile of paper records about the kinship titles of Yap home with him. Schneider, who had originally been researching the dreams of Australian aborigines, after publishing several papers about his research into the kinship system of the dusty island, gradually came to understand that Western theories of kinship based on blood relations were not easily applied to the conception of “kin” or “kinship” held by non-Western peoples; the idea of basing kinship on blood relationships, was undoubtedly an European-American ethnocentric assumption. In the end, Schneider became a famous scholar in the field of cultural anthropology for his book American Kinship. Translated from the Chinese original by Conor Stuart. Translation was first published on eRenlai here. This entry was posted in Home, My translations, Taiwanese authors, Translations, 中翻英 Chinese to English and tagged anthroplogy, Chinese colonialism, 蘭嶼, 黃郁茜, Huang Yuqian, Micronesia, Orchid Island, Rumung, taiwan, Yap, 台灣, 中國殖民主義, 人類學 by ladenframe. Bookmark the permalink.